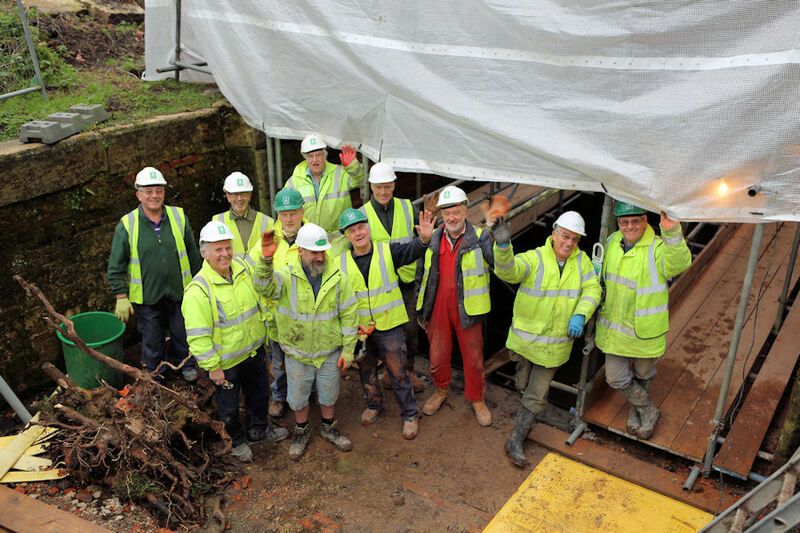 The CCT Ham Mill Lock Restoration Team Volunteers have been hard at work and progress is good inside and outside of the chamber. Having completed the removal of most of the defective bricks on the upper scaffolding level, work has moved to the lower level of the chamber. The new brickwork in the towpath side ladder recess is virtually complete and the offside recess is almost ready for bricklaying. The rapid progress on restoring the lock wall chambers means that it will soon be necessary to ensure the integrity of the upstream lock wing walls and other works. The energy, ingenuity and determination of the Ham Mill Team is typified by their use of what one member referred to as a ‘Spanish Windlass’ to join two lengths of Polypipe. The process involved a sliding loop being formed at each end of about four metres of rope. One loop was fitted tightly into a groove of the length of fixed ribbed pipe. The other loop was similarly applied to the final section that would form the outlet from the canal. A length of timber was twisted into the rope and turned, tourniquet fashion, to pull the two lengths of pipe together. Nigel Phillips of Stroud Angling Club (pictured wearing blue above) had joined the CCT team to assist in the installation. The result formed a drain to take the excess water from the pound safely down into the rushing waters of the River Frome. The pound was thereby lowered to enable the next spectacular, or even ‘monstrous’, step to take place on Wednesday 18th February. The spectacle was provided by the installation of the Aquadam to hold back the waters of the pound between Ham Mill and Hope Mill Lock. This aim has been achieved by what at first glance appears to be a large whale basking between the banks of the canal. In fact this is a 66ft feet long high tensile geotextile structure that has been dragged across the canal and pumped full of 800 tonnes of canal water. 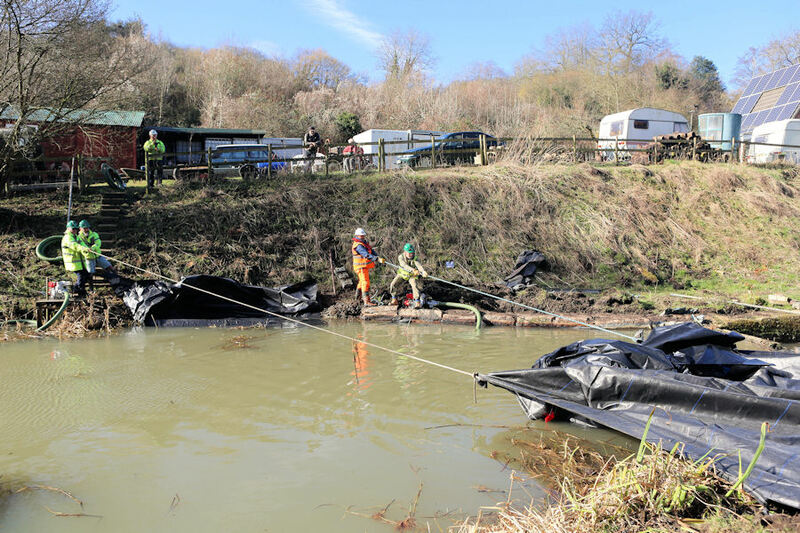 The Aquadam has been sourced as a joint enterprise between Stroud District Council, Cotswold Canals Trust and Stroud Valleys Canal Company. Five members of the CCT Ham Mill team have undergone training on its installation and safe use. The structure is 4.8 metres wide and 2.4 metres high. It can safely hold back a water depth of up to 1.8 metres. Two 3 inch diameter pumps worked for two hours to fill the Aquadam. The trained personnel are required to inspect the Aquadam at the beginning of each working day to ensure that it is fully inflated and stable before any work can commence in the de-watered area. 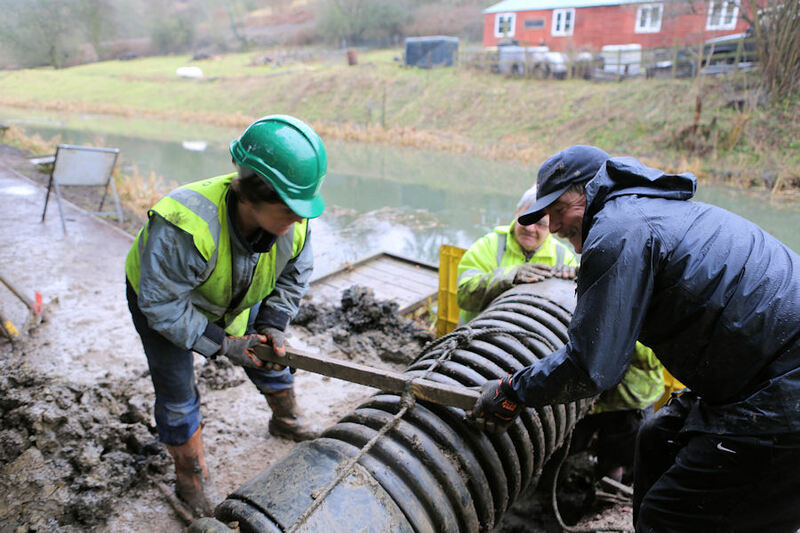 When work has finished at Ham Mill Lock, the Aquadam will be removed and used on other parts of the canal restoration.